The Ahn Trio is part of the Spokane Symphony's Vienna, City of Dreams show this weekend. Like many art forms, classical music labors under a stigma of popular assumptions that it constantly has to overcome to appear both vibrant and viable. The name "classical" alone imparts an air of dull, museum-like mustiness. That's why, for some time now, and with varying degrees of success, publicists and marketers have been trying to outfit Beethoven and his ilk with sunglasses and a pink mohawk in the hope of making classical music seem more relatable, more accessible and more interesting to audiences who don't necessarily view themselves as members of the classical music society. The musicians who are busy putting a fresh spin on classical music are often tagged with a slightly more adventurous label: crossover. They're the people who, intentionally or not, erase whatever lines you might have thought existed between one genre and the next, connecting the unconnected and fusing the discrete. Think cello arrangements of David Bowie, AC/DC and Metallica hits. "The term 'crossover' was invented by record labels back in the day, when some of the younger performers were, in the purists' minds, doing repertory that was weird," says cellist Maria Ahn, one of the three sisters who comprise the Ahn Trio. 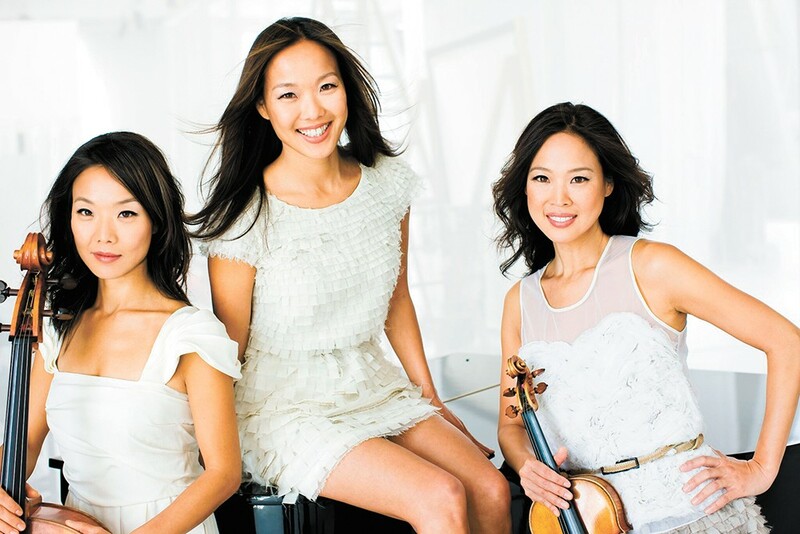 Although Ahn and her sisters — pianist Lucia and violinist Angella — are often billed as crossover artists, she prefers to describe the trio as a "classical music band." But the genre-melding approach is the same, not unlike cuisine. "Just because you grow up in America doesn't mean you only want to eat burgers," she says. "The French chef is influenced by Korean sauce. You see the fusion. What's really great in one culture will go to another, and the outcome is that sometimes it works, sometimes it doesn't." Truth be told, classical music has always been an exercise in crossover, drawing inspiration not only from other musical genres but other art forms too. Schubert took the poetry of Goethe and transposed it to equally eloquent German "lieder." Debussy drew on Asian pentatonic scales for his Estampes. Mussorgsky composed an entire piano suite "illustrating" the paintings of Viktor Hartmann. Shostakovich, for all the restrictions he endured under Stalinism, managed to compose two full jazz suites during the 1930s. "When you think about it," says Ahn, "all the classical music composers back in the day were very, very modern and ahead of their time, right? They were sort of the innovators, the rock stars. For the most part, the classical music world is very wide, and people just forget how open and wide [it] is. Look at Mark O'Connor. He brought this very Americana fiddle music into the classical music world. How do we categorize that?" O'Connor's Triple Concerto "March of the Gypsy Fiddler" is one of the pieces in Vienna, City of Dreams, the Spokane Symphony's seventh classical concert of the season, with Eckart Preu conducting. The Seattle-born, award-winning fiddler wrote it for the Ahn Trio expressly. "The first movement is this very stately opener melody, and the second movement is so lyrical and beautiful. And then the third movement is the really fun energy that also appears in his music a lot. To me, it's Mark's signature sound, these gorgeous string melodies. It's very Americana, very Appalachia," she says, likening the rich musical and emotional textures of the Triple Concerto to "watching a really satisfying movie." Works with more direct ties to Vienna are on the program, too, including Schubert's Symphony No. 9 (also known as "the Great"), which Ahn calls "one of the most amazing, iconic symphonies ever written," and Johann Nepomuk Hummel's Eight Variations on "Du Lieber Augustin," yet another example of how a popular folk tune can inform a classical score. Bach's short, sweet Air on the G String will be the cherry on top. The full Ahn Trio — with pianist and "fourth sister" Azusa Hokugo standing in for Lucia during their stint in Spokane — will also hold a cello masterclass on Feb. 23 with an open-audience invite extended to anyone who has an interest in music. The original print version of this article was headlined "Vienna Calling"